So around this time of year, people across the country start fretting about food. What they are gonna make, how many hours its gonna take, how are they gonna get it all done and clean the house and wrangle the kids and deal with all the family. I'm stressed out just writing that down. And, as usual we often forget the meaning behind the holiday. Its right there in the title - we should be giving thanks. I try to always make a few small donations to my local food banks and shelters around this time of year, just to help me keep perspective on the holiday since there are many people who are thankful for a hot meal. But this year, I decided to go even further. 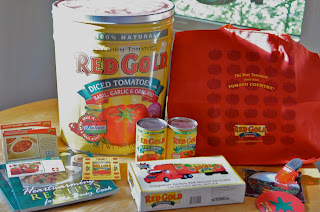 See, I got this email from Red Gold awhile back asking if I wanted them to send me anything. And while I don't normally do this sort of thing, they mentioned that they made a 15,000-pound donation of canned tomatoes to Mid-South Food Bank here in Memphis. Well, any friend of the Food Bank is a friend of mine. So, I got the goodie pack. And, I used the tomatoes in my chili recently. But, what to do with the rest of the stuff. Well, I have decided I would hold my first giveaway, readers, but with a twist. Not only will one lucky winner (choosen randomly) get the goodies pictured above, but for every entry the carnivore and I will donate a can of food to a local shelter. See we are thankful we get to enjoy so many great meals together and we want to give back. So, let me know what you are thankful for in a comment below. Then check back on Sunday and I will announce the winner and the grand total of the number of cans we will be giving away. I'm thankful for my wonderful family, friends, health and employment. I'm also thankful that I'm able to gather with family for the holidays. I am thankful for my health and that of my friends and family. I'm thankful that my parents and in-laws are traveling to us (rather than vice versa) this year. I get to cook at home and don't have to travel! And I'm thankful for bloggers like you who give back to their community! I am thankful for a loving, supportive family and an amazing husband! I'm thankful for a year of new love,growth,finding peace and happiness, and that my pregnant sister (and niece!) are both doing very well and staying healthy! I think it's great that you're donating! I'm thankful for my loving, supportive husband and that he puts up with my crazy family! I'm thankful for all the little things like a job and food and money to pay bills and of course my family! I'm thankful for my hardworking husband and for all that he does for your family. Also, for my spirited children who keep me on my toes and make each day wonderful. We made our food bank donation this year! What a wonderful opportunity for you and a generous offer from Red Gold. I'm thankful for my awesome family, even though I won't be seeing them for the holidays this year. My wonderful boyfriend, who puts up with all my food experiments and is a pretty great hugger to boot. My cats, who love me unconditionally and are always there to brighten my day. And the roof over my head, the food in my pantry, and the clean water in the fridge, which many people have to go without. I am thankful for blogs like yours that inspire me to cook better now for myself and my husband so that, one day, I will have healthy children that I will also live long enough to see grow and have families of their own. I'm thankful for the many blessings I have this year - my very supportive husband, jobs, my son, my dogs, health and wonderful family and friends. I'm thankful that my husband hasn't had to deploy or do field exercises our entire first year of marriage! We are so blessed. I am thankful for my wonderful husband. After nine years, he's the only one I can count on. what a great idea, so thoughtful of you! i am thankful to have an amazing support system of friends and family. i wouldn't trade them for anything in the world. I'm thankful for people like you who do something good for others.